Some Windows Software Update Services (WSUS) users got a surprise on their patching servers on August 20: A mention of Windows 7 Client. WSUS users get a surprise: Windows 7 clientThe actual Windows 7 client code was not distributed via WSUS. But the appearance of Windows 7 on the list of products that will be serviced over WSUS paves the way for Microsoft to start pushing something Windows-7-related to customers in the coming months. 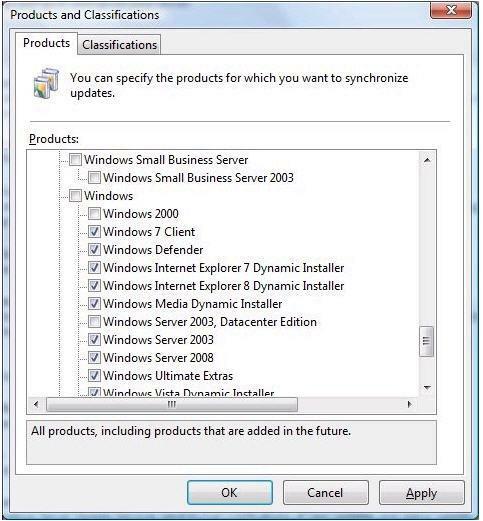 “WSUS doesn’t push products - just patches. so this could just be in preparation for something that is weeks or months in the future. It’s just a new category.” said one WSUS customer, who confirmed that he saw the “Windows 7″ box on his update check list this morning. WSUS is one of a number of Microsoft patching tools. Others include Windows Update and Microsoft Update. WSUS is typically employed by larger enterprises. Microsoft has been providing a select number of outside testers with early Windows 7 builds over the past few months. A first, more widely distributed test build is expected around the time of Microsoft’s Professional Developers Conference in late October, 2008. The final release of Windows 7 is expected in the latter half of 2009, according to Microsoft execs — and some partners who claim they’ve been told by Microsoft that the company is expecting to deliver Windows 7 before the usually touted 2010 delivery date.